One of the early stand outs thus far at the farmer’s market have been the radishes, they’re so perfectly sweet, peppery, and crunchy that I end up eating half a bunch before I even get home. And if you’re looking for an easy last minute snack or appetizer they’re amazing paired with some feta and watercress. 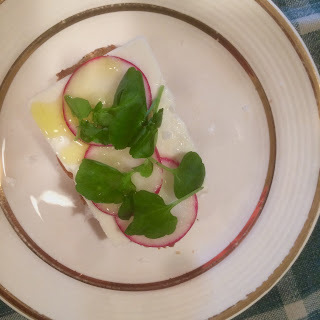 There are five elements to this bruschetta, grilled bread, thinly sliced room temperature feta, shaved radish, watercress leaves, and extra virgin olive oil. The coarse salt goes without saying. To get your bread brown and crispy heat a large pan over medium heat then add a generous pour of olive oil just before laying the baguette slices in the pan. Give them about two minutes per side. While they’re still warm layer them with the feta, radish slices, watercress, a drizzle of your best olive oil and coarse salt to taste. Summer is here, and that means every week at the farmer’s market gets better and better.